Conferences and Events for up to 180 participants take place in the four conference and event rooms of the Novotel Hotel Rotterdam Schiedam. An ideal conference location with excellent service. The Novotel Rotterdam Schiedam is a 4-star Hotel on the edge of Schiedam. This Schiedam Hotel offers free parking spaces and Wi-Fi access. It is ideal for business meetings or conferences. In summer you can relax in the outdoor pool and on the patio. The rooms at the Novotel Hotel Rotterdam Schiedam offersair-conditioning and free WiFi. 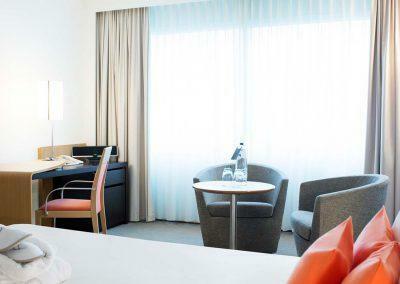 The Novotel Hotel Rotterdam Schiedam is a 4-star hotel with classy furnishing in a quiet and green location near the Autobahn Crossing Kethelplein in western Rotterdam. It is located on Rotterdams Ringstraße close to Europoort. The center of Rotterdam and the Airport can be reached easily by car, tram or train. await you at the Novotel Rotterdam Schiedam. All conference rooms are air-conditioned, furnished with modern conference technology and elegant design. are available in the conference rooms in theater formation. In classroom form the hotel offers conference space for up to 90 participants, and for banquets 128 participants. The largest conference space at the Novotel Rotterdam Schiedam is 195 square meters in size. await you at the hotel. All rooms have a modern design, and are equipped with a range of features such as WiFi and air-conditioning. Book now at the Novotel Rotterdam Schiedam for your conference or overnight stay and select from a range of offers and services. Enjoy a shopping tour in Schiedam, or visit the historical center of Delft in only 15 minutes drive. Whether city-trip, conference or business trip, at Novotel you will feel right at home. Free parking & WiFi incl.